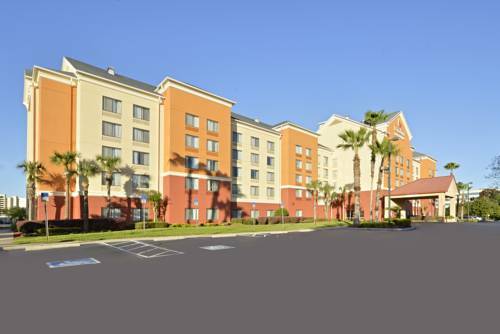 Behind every great day is a great night at the Comfort Inn and Suites Universal - Convention Center in Orlando, FL. With easy access to Interstate 4 and the Florida Turnpike, our hotel puts you near the Orlando Orange County Convention Center and the Orlando International Airport, plus all the amusement parks that make this city a major destination. Enjoy our free hot breakfast, free WiFi, fitness center and outdoor pool. We also offer meeting space and business services. Amenities in your suite include an HDTV, desk, microwave, refrigerator, coffee maker, hair dryer, iron and ironing board. Also, earn rewards including free nights and gift cards with our Choice Privileges Rewards program. - Orange County Conv. Ctr.